Nourished by reserves from the fortuitously wet winter before, a panoply of spring ferns and wildflowers flourishes under the cover of gigantic old-growth Douglas-fir and telephone-pole-perfect western hemlock. It was a mixed blessing of sorts as Ashley, Terence, and I barely made it halfway to our mountain viewpoint destination as planned, so distracted as we (okay, mostly Terence and I...) were by the endless opportunities for various foliage and flower closeups, including Terence's remarkable handheld capture of some shockingly green star-flower Solomon's-seal (Maianthemum stellatum). Here, a trio of dwarf dogwood flowers (a.k.a. 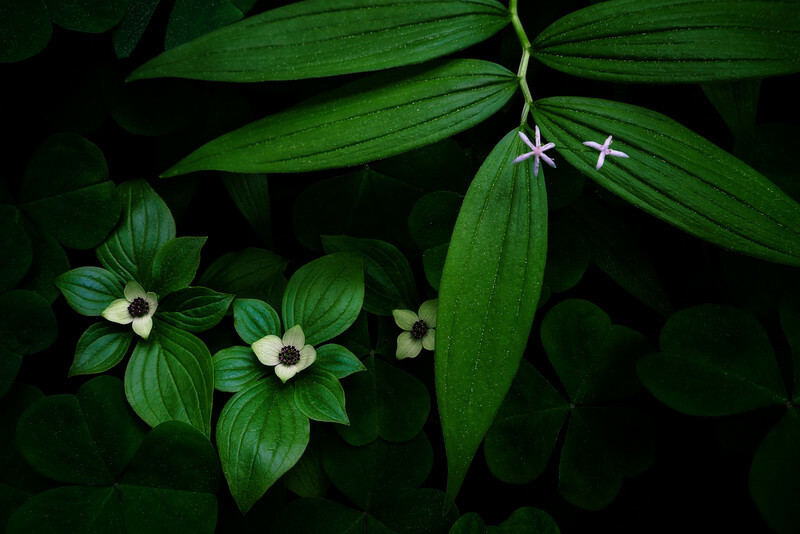 bunchberry, Cornus unalaschkensis) and a sprig of star-flower Solomon's-seal subtly catch the light in a dark sea of wood sorrel (a.k.a. sourgrass, Oxalis oregana).